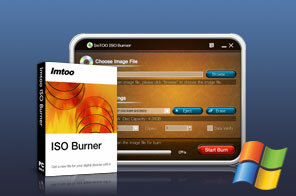 ImTOO ISO Burner is an easy-to-use DVD ISO burner software. With it, you can burn ISO image file to DVD or CD disc easily. It can also help you burn DVD disc from other image files including BIN/CUE, IMG, MDF, NRG, CDI, B5i, B6i, DMG. ImTOO ISO Burner can burn not only ISO file to DVD, but also other image files like BIN/CUE, IMG, MDF, NRG, CDI, B5i, B6i, and DMG. With fast writing speed, the CD/DVD ISO burner has the ability to burn image file to most popular CD/DVD disc types including CD-R, CD-RW, DVD-R, DVD+R, DVD-RW, DVD+RW and DVD+R DL. ImTOO ISO Burner provides you with more options like erasing rewritable disc, selecting writing speed, and verifying written data to make perfect burning process. Burn ISO image file to DVDs/CDs and burn BIN/CUE, IMG, MDF, NRG, CDI, B5i, B6i, and DMG image file to DVDs/CDs. Support several source image files including data CD/DVD image, bootable CD/DVD image, media CD/DVD image. Burn ISO and other image files to those CDs/DVDs: CD-R, CD-RW, DVD-R, DVD+R, DVD-RW, DVD+RW and DVD+R DL. Now support burning CD disc from CUE/BIN, CUE/FLAC, CUE/APE and CUE/WAV files. Prompt for errors in CUE file, and automatically correct the relevant BIN/FLAC/APE/WAV file names specified in CUE file. Provide you with maximum writing speed that the target disc and recorder can support. Verify written data after the DVD ISO burning process to ensure the usability of the disc content. Help you erase the content of rewritable disc if necessary when burning CD/DVD. Provide selectable writing speed and support burning one source to several copies (up to 100 disc copies). Auto process one of after-done actions: shutdown, exit, hibernate or standby after burning done. The burning process bar will clearly show process details like the elapsed time and time remaining. Provide multi-language interfaces, that is, English, German, Japanese and Chinese. Tutorial : How to burn ISO and other CD/DVD image files? Make ISO image files from Data CD/DVD and video DVD. Create ISO image files from CD/DVD, videos, music, and any data on your computer. Smart DVD creator software to convert and burn AVI to DVD, MPEG to DVD, DivX to DVD, etc. Powerful DVD converting software to convert DVDs to all popular video and audio formats.